In the first half of my Bolivian adventure we traversed all the sights of La Paz, and acclimatised to the 3500 metres induced altitude, caught a Bolivian Airlines jet to the fast-growing town of Uyuni, took a four wheel drive onto the Salar salt flats for lunch, checked out the extraordinary railroad cemetery, and took in the sights and sounds of the centuries old mining town of Potosi. After Potosi we were La Paz bound again, including a short stopover in the “white” city and national capital Sucre. It gets its name from the fact that most of the buildings are in a stark white finish which lends it a very European look. From there to the very modern city of Cochabamba and another flight back to my tour HQ in the upmarket La Paz suburb Florida. I had another early start the following morning and I was excited for what I hoped would be another highlight of my time in Bolivia. I wasn’t to be disappointed although the early part of our journey through the El Alto area above La Paz was an introduction to perhaps the worst roads I have experienced anywhere. We eventually arrived in the eye-catching township of Copacabana on the banks of the world famous Lake Titicaca. A few spare minutes allowed us to explore yet another beautiful church, a feature of Bolivia that has to be seen to be believed. That’s what centuries of Spanish and Catholic influences deliver. We left Copacabana aboard a hydrofoil en route to Isla del Sol (Sun Island) for an overnight stay. From the wharf on Sun Island to our Hacienda style hotel it was a mammoth climb up a never ending hill with breathing breaks every 50 metres or so. However, the pay-off that night was memorable as we viewed a sunset over the hills of Peru from the high point of 4500 metres, followed by a spectacular electrical storm. On both Sun Island and its sister Moon Island there are interesting Inca-like ruins to explore, and everywhere there are indigenous women plying their wares of blankets, and colourful Bolivian trinkets. 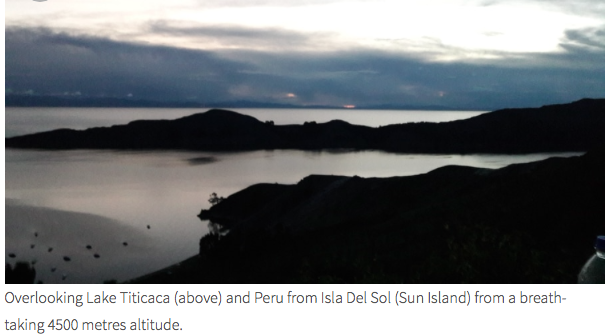 Isla Del Sol and Lake Titicaca was the highlight I hoped for and is also a must for any Bolivian itinerary. By now my days in Bolivia were coming to an end but not without a visit to what was perhaps the most sophisticated and cosmopolitan city, Cochabamba, although La Paz does give it a close run. My Bolivian host Alfredo and I made the journey by road, which included a rather interesting experience with a local law enforcement officer striking a deal with Alfredo when he was copped doing 180km. Cochabamba is a very modern city overlooked by El Cristo, a gigantic statue of Christ, apparently even taller than its more famous counterpart in Rio De Janiero. One aspect of my two weeks in Bolivia that well deserves a special mention is the food. La Paz has some world-class restaurants including Yerba Buena, where I was also introduced to the local rocket fuel, namely Singani which is an essential aspect of Bolivian life. It’s a grape distilled spirit which can be taken straight, or preferably in my case, with Canadian tonic. My best food memory though was at restaurante Gustu, at which we had the privilege of dining at a special table within the kitchen, overlooking the rest of the diners. The owner and chef is a Frenchman and the degustation type menu was to-die-for. I was lucky in one respect in that I had a local family with whom I had contact. Between them and Uyuni Travel my time in Bolivia was maximised with an action-packed schedule. This entry was posted in Bolivia, Business, Cochabamba, Holidays, La Paz, Potosi, Tourism and tagged bolivian food, Catholic Church, Copacabana, Salar de Uyuni, Sucre, Titicaca Lake. Bookmark the permalink.